Wednesday November 30th 1881 I hurried through with my work this morning and sat down to sew. I stopped an hour in the afternoon to take a music lesson and sewed till late at night to finish what work I had on hand. Thursday December 1st 1881 I went to town this morning and got some stuff for new napkins and the material to make a lamberquin like the tidy I brought home from Delavan. I finished the napkins by the middle of the afternoon and began the lamberquin. Aunty Walker was here all day. I practiced in the evening. 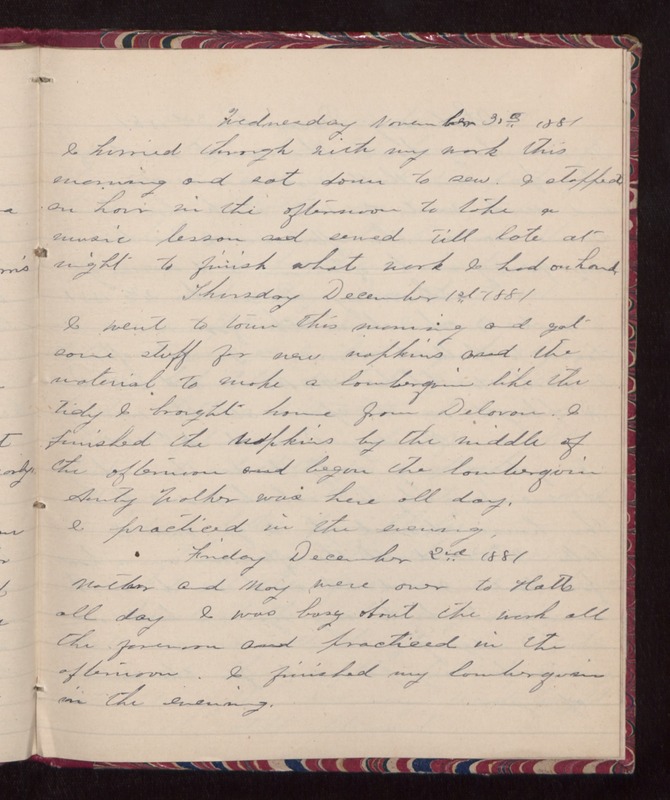 Friday December 2nd 1881 Mother and May were over to Hatts all day I was busy about the work all the forenoon and practiced in the afternoon. I finished my lamberquin in the evening.